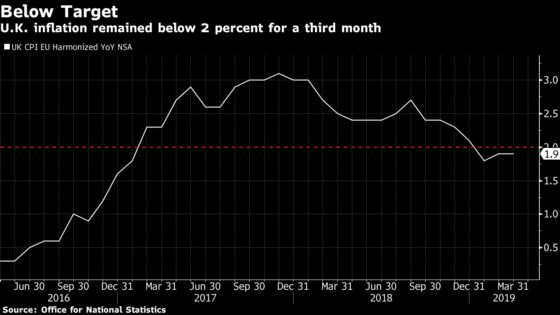 (Bloomberg) -- U.K. inflation unexpectedly stayed below target last month as higher fuel prices were offset by the cost of food and computer games. Annual consumer-price growth remained at 1.9 percent, its third month below the Bank of England’s 2 percent goal, the Office for National Statistics said Wednesday. Core inflation held at 1.8 percent. The figures leave prices rising much more slowly than wages, a boost for consumers, whose spending drives the British economy. The lack of headline inflationary pressure gives policy makers breathing space to keep interest rates on hold until the Brexit crisis is resolved. The pound was little changed following the data at $1.3042. Rising oil prices saw the cost of filling up a vehicle climb 1 percent last month, compared with a 1.3 percent decline a year earlier. But food costs fell 0.1 percent and the recreation and culture sector saw prices rise more slowly than they did in March 2018. This was driven by games, toys and hobbies as well as the cost of compact discs, videos and music downloads, the ONS said. Inflation in the services sector, seen as proxy for domestically generated inflation, held at 2.5 percent for a third month. Goods inflation remained at 1.3 percent. Pipeline cost pressures were also subdued. Producer input prices fell 0.2 percent from February and were up just 3.7 percent from a year earlier. Output prices rose 0.3 percent on the month for an annual gain of 2.4 percent. Brexit fears and affordability constraints continued to take a toll on the property market, with annual house-price growth slowing to 0.6 percent in February, the least since September 2012. 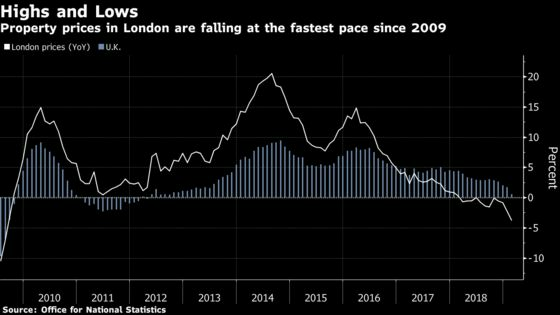 The worst-performing region was London, where property values declined 3.8 percent, the biggest annual drop since August 2009 when Britain was in the grip of the global financial crisis. Prices in the U.K. capital have fallen for four consecutive months and now stand at 460,000 pounds ($600,000) on average, the lowest level for three years. The decline over the past year was more pronounced in inner London boroughs, which slumped 4.1 percent. House prices in Westminster fell almost 20 percent, leaving Kensington and Chelsea as the only U.K. district where prices still average more than 1 million pounds. Values in outer London fell 1.1 percent. House prices in southeast England also posted an annual fall for the first time since 2011. The best-performing regions were Wales, Northern Ireland and the west of England.